hmm so i want to do a little review on 2 of O.P.I 's colours.. normally they do great polish.. I love alot of them. the skin and your removing it with a orangestick and cotton wool, it peels. which pulls up some of the polish on the nail and makes a big mess.. I'm disappointed in these polishes. all the other o.p.i's are great. just not these. idk what they did wrong :/ I've read alot of the reviews and everyone has experienced the same thing..
Now I'm not being shy to speak my mind here. Like I said nearly all O.P.I polishes are great just not these 2 and I'm not going to lie about it. anyway here is whats with the cattitude 3 coats. as you can see.. how messy! esp around the cuticles. thats because if you try and tidy it will pull the rest of the polish and make it look horrible! normally I dont get the polish on the skin but ocassionally some does get there, esp after doing 3 coats. It also applies very streaky but luckly its ok by the 3rd coat. This is the finnished manicure taken with no flash because flash washes out the colour. Again how messy. Because of this its taken over a hour to do a simple halfmoon manicure. Hey everyone~ I've decided that I might start swatching a few polishes and reviewing them every now and again. first after applying basecoat i did 2 layers of "turned up turquoise"
the ten man is also good because it has alot of glitter in is aswells as the silver colour so its real sparkly. 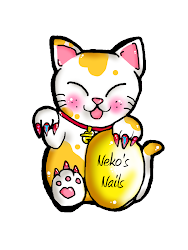 hi there :) Ive decided to do my own little nail art contest. Anyone can enter and can enter as many entries. 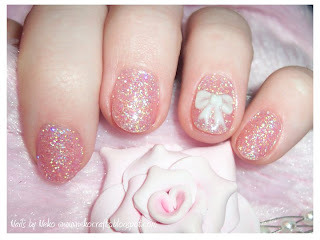 Theme is cute = bows, hello kitty, stars, hearts, etc..
you can use any products you want :) it would be best if you use a hand model or you own hands. min of 4 nails in each pic please. MUST BE YOUR OWN WORK.